If you are serious about table tennis you know that practicing is the single most important way to improve. But it may be that you simply don’t have a practice buddy(it is pretty hard to find someone with the same schedule, ambitions and goals as you) or you just want that extra practice to really push yourself. In any case, getting a table tennis robot will give you the best results. Although nothing can replace a good practice partner, a table tennis robot sure comes close. Because of its “robotic” consistency, it is especially useful for improving your stroke mechanics. It can hurl balls at you in the same spot with the exact speed and spin that you tell it to. Because of this, you will master the stroke much faster but you have to keep in mind that you can also develop a bad habit if you don’t know how to perform the stroke correctly. You should first practice with a coach and then with the robot. You can even practice footwork, as it can vary the ball placement shot to shot, forcing you to move. Here are some other benefits: it doesn’t get tired, it is portable, it’s programmable, doesn’t take much space, and it doesn’t complain. Sounds like the perfect practice partner to me. It is no secret that we live in the era of technology. Every year we get new gadgets and devices one more advanced than the other. Well, the same holds true for ping pong robots. Choosing the one that is best for you can become a daunting task in this over saturated climate. There are a lot of models to choose from, each one with its strengths and weaknesses. To make the best choice you have to consider things like your current level, features and of course, budget. Before diving in and spending your hard earned dollars, consider if you really need a robot. What is your current level of play? If you still consider yourself a beginner, then it would be best that you first take some coaching lessons to really lay down the fundamentals. After you can perform all the basic strokes somewhat consistently you can go ahead and get a robot. Every day robots get increasingly advanced. 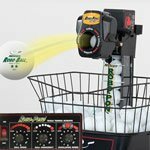 In the last couple of years, they evolved from just shooting a ball at varying speeds to applying all kinds of spins, performing ever more complex drills and even connecting to your smartphone to keep track of your progress. I will not be surprised if they will soon walk by themselves and even make you breakfast. Here are some of the main features you have to think about when choosing a robot. This refers to the size of the ball container. The bigger it is the more balls it will be able to hold. This will directly affect how often you have to pick up the balls and refill it. Unless... unless you get a model with a recycling net. 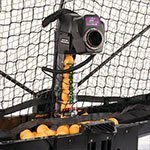 These robots come with a special net that goes behind the table, collecting and feeding the balls automatically to the machine allowing you to train non-stop. One of the most important aspects of table tennis to master is ball spin. Not all table tennis robots can produce all types of spin. For example, some can’t do backspin, so it will be useless for you if you want to improve your game against chopper style shots or backspin serve receive. More expensive models can produce all kinds of spin including a combination of two to really keep you on your toes. The newer models come with wireless remotes that let you change the settings on the fly. This really matters when you want to switch from no-spin to topspin and you are too far away. Some models have their remote connected by a cord which affects the distance from which you can use it. It really is a convenience issue though. Here you have to trade portability for raw power. 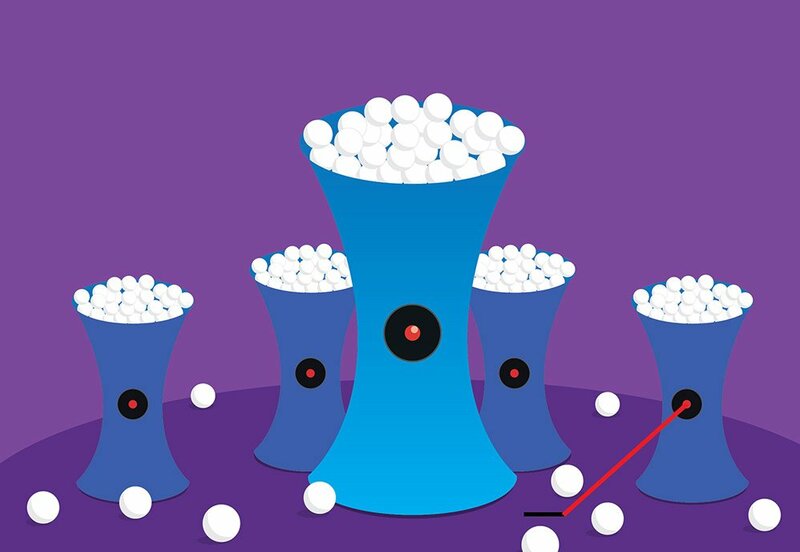 A plug-in robot will be able to deliver faster, more powerful balls without being limited by battery life, but on the other hand, a battery-powered robot will be easier to carry and set up while still being able to deliver all types of spin and shots(although not as fast). Are you planning on taking the robot with you to the club or do you have a table tennis table at home? Some robots weigh too much to be practical to carry around while others will fit in your backpack easily. Some table tennis robots will allow you to program your exact drill sequence(ball placement, spin type, pauses between shots etc) and adjust the speed of the balls to your liking. If you just need some extra practice to improve your backhand for example, you may not need all of these features and will be saving a lot of money. Like with any device, the more it costs the more it will do. You have to keep this in mind when assessing a table tennis robot and not expect a $200 to be as good as a $1000 one. A lot of brands have multiple products at different price points and some can even be upgraded. So pay attention to what features a robot has and decide for yourself if you can live without some of them and go for a lower tier model. You should now have a better idea of what to look for when making a purchase. So without further ado, here are the best table tennis robots you can get right now. We’ll start with the best first. This is our number one choice. It is no doubt the best robot money can buy. It has all of the capabilities that you can think of, all packed into a compact machine that is easy to deploy and transport. Unlike other robots, the Amicus has three separate launch wheels which allow it to produce any kind and any amount of spin in the same drill. It can do backspin, topspin, sidespin, no spin and any combination in between. Best of all, the spin is not connected to the speed. It can be programmed to perform pretty much any exercise you come up with and if you can’t think of any, it also comes with 21 pre-programmed drills so you can start training right away. You can input into its memory up to 99 different exercises which should be enough even for the most advanced players. Each drill can have up to 8 steps. To better simulate match conditions, you can turn on the “rnd” mode. This randomly shots the balls from your drill within a 20 cm area. So after you feel that you mastered the exercise, turn on this mode so it will become a challenge again. And yes, it also has a ball recycling system so you can keep on training without having to pick up the balls and refill the machine. The best way to use the Amicus Professional, or any robot really, is to include some coaching sessions into your training schedule to make sure you are not practicing with bad technique. The Butterfly Amicus Professional is a marvel of engineering. They really outdid themselves with this one. Sure there are cheaper robots out there, but none can compare with this one. Next up we have a robot that is similar in capabilities as the Amicus but it features a totally different design. Don’t let the mechanical appearance fool you, this is one of the most advanced robots out there. 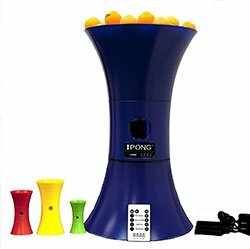 It comes with a touchscreen remote and can be programmed to shoot the ball on 22 different spots on the table with any spin and in any order. The main area where it differs from the Amicus is in its design. Because it is a standing type of robot, setup and deployment is virtually non-existent. You just have to attach the net and you are ready to go. The drawback is that it becomes pretty hard to transport. Like the Amicus, it also has a number of preset drills(30 to be more exact) ranging from easy ones to advanced so you can start practicing right away and constantly be a challenge. The H2W comes with a ball recycling system which allows the net to capture the balls and funnel them back into the robot. You can play until you run out of breath instead of balls. A feature that the Amicus doesn’t have is the spin indicator. As you very well know, reading spin and reacting accordingly is one of the most important skills you have to develop when playing table tennis. Right before a ball is shot, the indicator will tell you what type of spin it will have. This will help you learn to read spins much faster. This is definitely not a tool for beginners. It is a fully featured advanced table tennis robot that will allow you to fine tune your training routine to the finest detail. If you are serious about table tennis this robot will absolutely prove its worth in time. Here we are crossing into a different price category where some features have to be sacrificed to achieve lower costs. The Robo-Pong 2050+ is Newgy’s best offering. In short, where it differs from the above two robots is that it cannot shoot different types of spin within the same drill. It was updated to handle 40+ balls and comes with 48 2 Star 40+ balls to get you started right away. 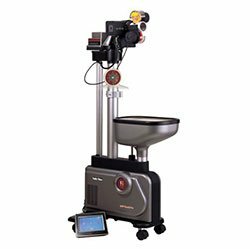 It is a digital robot which means that it can be programmed to do exactly what you want, making it a valuable practice partner. The drills that you save into its memory can be shared online and you can even download new ones from the community. You can also vary the speed of the ball in case you were wondering. It also features one of the best recycling netting system in the industry. There are two separate nets one of which is looser to absorb all of the ball’s energy and prevent it from bouncing back onto the table. This works really well and will improve your training experience as you will be able to focus on one ball at a time. Apart from not being able to switch spins mid-drill, it has another weakness. Because it has only one head, the ball’s spin and speed are connected. The faster the ball the more spin it will have and vice versa. But then again... it is less than half the cost of the Amicus. Considering all of these it is still a very solid table tennis machine. Used in conjunction with a practice partner or a coach, it will help you improve much faster. This is the least expensive robot on our list and the best robot under $200 you can get. It can produce both topspin and backspin, it is incredibly practical and it comes with a handy wireless remote. Out of the box, the robot comes in three pieces that will fit together nicely. Transportation is a breeze with this robot as it is very light and can fit basically anywhere. The remote allows you to adjust ball speed, spin type or turn on oscillation mode and set its speed. In this mode, the robot will shoot balls alternatively to each side of the table forcing you to move your feet, allowing for a more realistic training session. 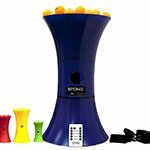 It has a capacity of up to 100 balls and it has a maximum speed of 90 balls per minute. You will probably set it at a much lower setting than this as even 60 balls per minute is pretty fast. Another cool thing about this robot is that it comes with some small plastic versions of itself. They serve as targets to improve your aim and let me tell you, they are pretty effective. 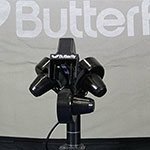 The V300 is the perfect robot for beginners because at that stage they will benefit the most from repetition. Learn the correct stroke movement and then repeat a thousand times with the robot. The oscillator function can also help with footwork and will give you a pretty good cardio workout. Its small size makes it perfect for home use if you have a table set up. It is a blast to play with your family or friends and considering the price, it will be a challenge to find a better robot that looks and plays as nice as this one. The last on the list but by no means a bad robot. This is a stripped down version of the Robo-Pong 2050+. If you feel like you don’t need all the bells and whistles of its older brother than this may just be the perfect robot for you. So what is missing? Well, it doesn’t have a ball recycling net and it is not programmable, both of which can be purchased separately to upgrade to the 2050+. On the plus side(besides the much lower price) because of its simplicity, it is incredibly easy to deploy. Just take it out of its box, plug it in and start playing. It comes with a bucket extender which gives it a ball capacity of 200 which is more than enough for a 15-minute intense training session. 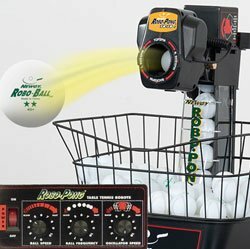 There is an analog control box where you can set the ball speed, oscillation and other options. 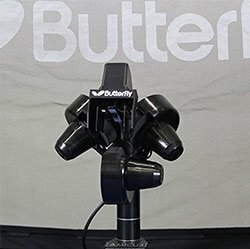 This is the perfect robot if you are looking for something simple to help you nail down those tricky shots or improve your footwork. It doesn’t have a lot of features but considering how much it costs, it is a steal. It is one of the best entry level table tennis robots you can buy. There you have it, the best table tennis available. It doesn’t matter if you are a newbie or an advanced player, you should be able to find a robot on this list that is best for you. Just keep in mind that in the end, it is still just a robot. It cannot tell you if your technique is off or if your stance is wrong. Only when you complement your training with some coaching lessons will you be sure that you are improving and not developing any bad habits. Here is a useful video from Tom Lodziak.